When making a card for the color challenge on Splitcoaststampers this week, I did the additional card above adding a little More Mustard to the Soft Suede, Pale Plum and Perfect Plum colors. I really think these colors needed a shot of something bold to bring them to life. 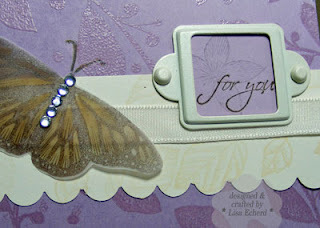 The challenge also encouraged us to add a "critter" - in my case, a butterfly stamped on vellum. The card I submitted for the challenge is this one. It was a real struggle. You can usually tell I'm having trouble when I just keep throwing stuff on a card. 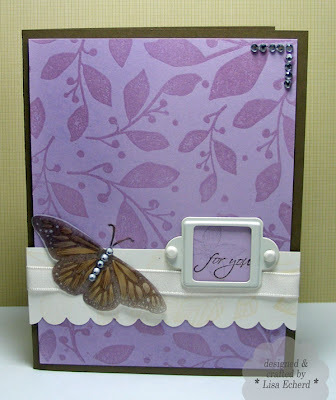 I love the embossed background on Pale Plum with a little Perfect Plum pastel on the edges but just couldn't make the butterfly work with it. It was too dark and dull. The Vanilla Hodgepodge hardware really came in handy here. The rhinestones are cut from some rhinestone letters. The capital "Z" looks much better adding some zing to this butterfly than lounging in one of my storage drawers. Whew! Now I know why these things are called challenges. Ingredients: Stamps: Branch background from Hero Arts; God's Beauty, Make It Count and All Holidays from SU!